The Print-Digital Divide: Are You Choosing a Side? What is it about ebooks that’s so contentious? How can they send some people into rhapsodies that used to be reserved for TiVo, while others claim they’re a sign of the impending apocalypse? Superhero Vela Kurv. Image by Victor Ishimura. All rights owned by Riley Rose. At the West Hollywood Book Fair, I sat next to a good friend at the Digital Publishing panel, and the two of us couldn’t have been further apart. Riley Rose owns several e-readers, loves them, and has published her own series of sci-fi, action-adventure ebooks, Vela Kurv, on Amazon’s Createspace, Smashwords and Lulu. Rose could anchor a panel on ebook publishing, navigating the myriad options and publishers, and how to handle the technical aspects, including promotion. She practically did after the panel, when she was deluged with questions from the audience. Thinking about our divided opinions made me want to explore both sides further. What I discovered – after a lot of reading and research – is that the pros and the cons of ebooks are not nearly as easily defined as each side would like to think. The head of Jaded Ibis publishing, Debra Di Blasi, in the latest issue of Poets & Writers, says she founded her company because books by innovative writers “were deemed unmarketable” by traditional houses. Note she’s not talking about books that aren’t good. What she’s lamenting is that many traditional publishers, operating on slim margins, find it next to impossible to take on books that appeal to smaller, or niche, audiences. Di Blasi is able to pay her authors a percentage that’s far higher than most big publishing companies: “at least 40 percent of net royalties,” according to Poets & Writers. For both these reasons – the ability to tell different kinds of stories with unique characters and the potential for greater control and returns – many authors are choosing to self-publish rather than engage even the boutique publishing firms. Like my friend, Riley Rose, who created a nontraditional sci-fi heroine – Vela Kurv is a woman of color of Amazonian proportions – tens of thousands of authors took to self-publishing their books last year. Vela Kurv Legacy Series, Part I (Smashwords BYCAB Edition – The Scintillate Seed to Vela Kurv) Your coupon code is NL99M (not case-sensitive). Vela Kurv Legacy Series, Part II (Smashword BYCAB Edition – The Wiles of Vela Kurv) Your coupon code is XA58Q (not case-sensitive). What’s lovely about the existence of ebook publishing is that it makes the storytelling community more vital for everyone – readers and writers, alike – simply by offering more options. This one’s a no-brainer – you can add more books without lugging around more weight. This is why ebook readers are great for commuters, travelers and parents of cranky toddlers. Forgot to bring a book? Just download one. A device would’ve come in handy when I was touring the Greek islands a couple of years ago. I finished the books I’d packed long before we reached our final destination of Santorini. Once you’re ferrying between islands on the Aegean Sea, there aren’t a lot of shops that carry English-language books – and the ones that do charge a hefty price in euros. I think I wound up paying €17 for a paperback of Dexter by Design. 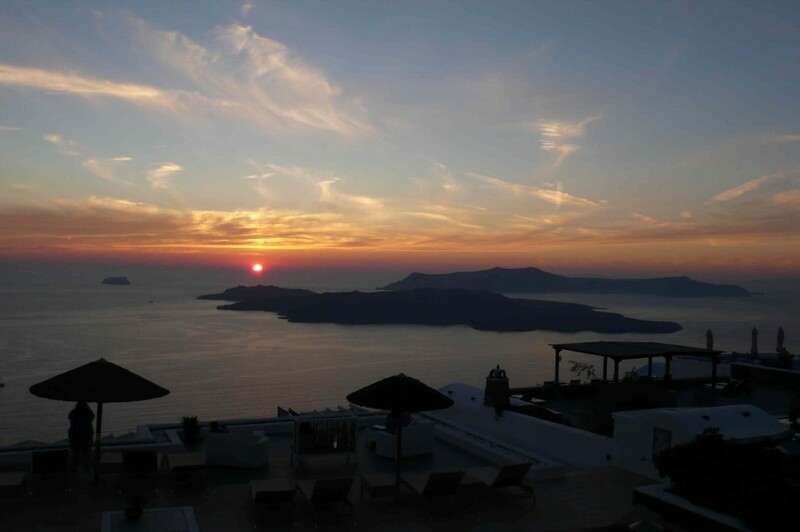 Sunset over Santorini in the Aegean Sea. Photo by Vickie Bates. If you can’t power your device or find network access, then you are truly stuck. Not only do you not have something to read, all those apps and games and emails you planned to have fun with? It’s Game Over there, too. You’ll be just like me, wandering around Santorini, willing to pay anything for something to read. On the other hand, there’s nothing worse than wanting to read a new book right now and having to wait for a bookstore or library to open and then discovering they don’t have it. With ebooks, if you devoured The Hunger Games and love-love-loved it, you can download Catching Fire and dive right back in to the world and characters created by author Suzanne Collins. You just finished Pride and Prejudice and you’re wondering why it took you so long to discover Jane Austen? Click on Sense and Sensibility or Emma or check out her unfinished works, and you’ll be transported back to her world within seconds. I feel like Bill Maher saying this, but: Stop pretending a downside is a feature, people! At the end of the day, an e-reader is yet another screen glaring back at you – just like your computer, laptop, tablet, phone and TV. Don’t you get enough of this? When you go to bed at night and close your eyes, what image does your retina retain on the inside of your eyelids? Let me guess: It’s a dark rectangle with a glowing screen in the middle. Books don’t need special backlights. You can read them in the sun, you can read them indoors, you can read them at night, you can read them under a lamp, by candle or flashlight. Five hundred years of engineering has gone into optimizing the perfect “device” for reading: It’s called a book. Getting too attached to the latest whiz-bang, backlit reading device comes with a downside. It may not be around for long. It took 20 years to get from the “Star Trek” tricorder to the first commercial tablets; another 10 for Apple to introduce the Newton; and 14 more for the first Kindle to arrive. All sorts of advances in technology may change ebooks and the digital reading experience in ways even Gene Roddenberry couldn’t have dreamed of. Google already is working on creating the smartphone/tablet experience in glasses – maybe you’ll be reading novels that way in the not-so-distant future. Or, better yet, perhaps there’ll be a 4D experience that takes anything you want to consume – TV show, movie, concert, class, book – and projects it precisely where you want it to be, at any distance or angle that you desire, while you do the dishes, tuck in a child at night, or lounge in bed. Perhaps it’ll even flip pages or channels based on your eye movements. When I started writing this piece, I honestly thought I knew how it would end, that my arguments for print books would win out over ebooks. But, in researching the subject, I find it more nuanced than good/bad or new/old. It’s turned into more of an exploration than a debate, for me. And it’s grown much longer than I expected. In Part Two, I’ll look at pricing, multimedia, deep versus distracted reading, and more. In the meantime, I’d love to know what you think about ebooks and print books, which reader you prefer (or not), and what you predict the future of reading might hold. This entry was posted in Reading and tagged digital publishing, e-readers, ebooks, print books, self-publishing, Vela Kurv by Vickie Bates. Bookmark the permalink. But as for e-readers themselves, well I haven’t taken the plunge yet and it’s not because of technophobia, or because I’d rather feel a book and its pages in my hands (although that IS nice), but it’s for a reason I rarely see discussed: motion sickness! I tend to feel light-headed and nauseous when scrolling through print articles on my computer, and also when scrolling through people’s photos on their iphones. It’s made me hesitant to purchase an e-reader for air travel, even though such readers would be perfect for all types of travel. Have you ever seen this issue addressed? What do I think is the future for books? I think both types of books will co-exist for awhile because of the advantages to each and because many people still love the look and feel of print books. But, probably by mid-century(? ), ebooks will win out due to factors like paper shortages (maybe), ease of use and portability (probably) and the fact that people born in the 21st century are creatures of an entirely digital world (definitely!). Getting motion sickness while reading or viewing photos is no fun. I’m so sorry to hear you experience it while viewing devices. I hadn’t heard or read about this when I did my research for these posts, but a quick search brings up several instances of it – so you are not alone! I suppose if you’re reading a book on a device, you wouldn’t be scrolling through it so much as turning a page every now and then. Perhaps that is less nauseating? I’d love to hear from anyone out there who’s experienced this – and any advice they have. I’m sad to admit you may be right about the demise of the book. It does make me wonder if those of us who retain our cluttered bookshelves will seem as outdated as “Downton Abbey” come mid-century! Wait.. can I get this article on audiobook? You’re a mindreader, Garick! I was just talking with Riley Rose over lunch, and she reminded me that I didn’t bring audiobooks into this discussion.